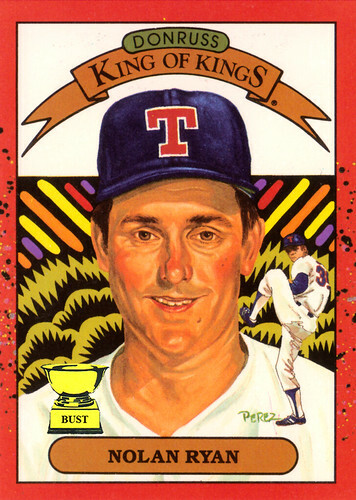 Bow down before the one you serve: In 1990, Donruss granted Nolan Ryan what is truly the greatest honor in baseball history: Donruss King of Kings. (Not to worry they kept pumping out regular old Diamond Kings for several more years.) With the distinction came a handful of benefits such as golden bolls of cotton, multicolored laser beams and a small painting of himself looking kind of like Tim Robbins in "Bull Durham." But, going by the above larger, more stunning portrait, what should the King of Kings' historical nickname be? Here are some options. The worst "Perez" EVER, without as doubt. He must have held some kind of grudge against Ryan, because that mouth and its multi-tierd-teeth offering makes Nolan look, well, like a space-alien from Neptune.